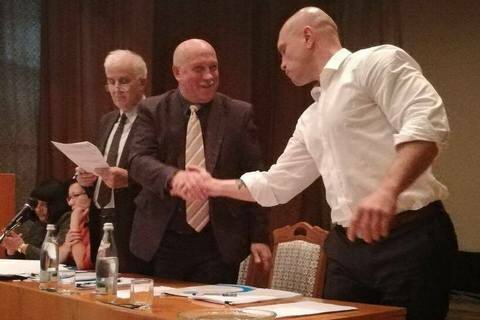 Kiva also heads the Socialist Party, Ukraine's Domino Federation, the National Federation of Domestic Football, and the Union of Disabled Persons. Illya Kiva has said on Facebook that he was elected chairman of the Interior Ministry's trade union. He attached photos from the union meeting to the post. In July, Kiva was elected chairman of the Socialist Party of Ukraine (SPU). Kiva also heads Ukraine's Domino Federation and the National Federation of Domestic Football and the Independent Union of Disabled Persons. Illya Kiva from October 2015 to May 2016 headed the National Police department for drug-related crimes. A native of Poltava, Illya Kiva became a member of the local police in September 2014. He headed the territorial defence battalion Poltava, but had to resign because of the rebellion of subordinates. In December 2014, he was appointed deputy chief of the Donetsk region police directorate. In June 2015, Kiva moved to the post of deputy head of the Kherson regional police directorate and held the post until he was pointed to the drug crimes department. Kiva repeatedly avoided mandatory police vetting in 2015. In April 2015, the then head of the National Police, Khatia Dekanoidze, sought the dismissal of Kiva after he had admitted in an interview that ATO veterans would "sooner or later" kill him, although he did not elaborate on possible reasons. Eventually, Interior Minister Arsen Avakov under public pressure promised to sack Kiva. Prior to joining the police force, Kiva was charged with bribery when he was a deputy head of the Poltava regional state administration for consumer rights. However, a court quashed his conviction in August 2014. The Socialist Party of Ukraine is one of the oldest political forces of the country. Founded in 1991 by Oleksandr Moroz, the party was represented in parliament from 1991 to 2007, but saw a decline in popularity after a coalition with the Party of Regions in 2006. In 2012, Moroz resigned as SPU leader.